addition of a powerful 6500 watt Preheater for thermally challenging assemblies, an Extended Board Carrier, and a sturdy Base Plate. • Sensor indicates when the preheat temperature is reached. • Carrier is then slid back with board over the solder at a set position. PCBRM Module, Board Carrier and Preheater with video clips of various components and flow well configurations. 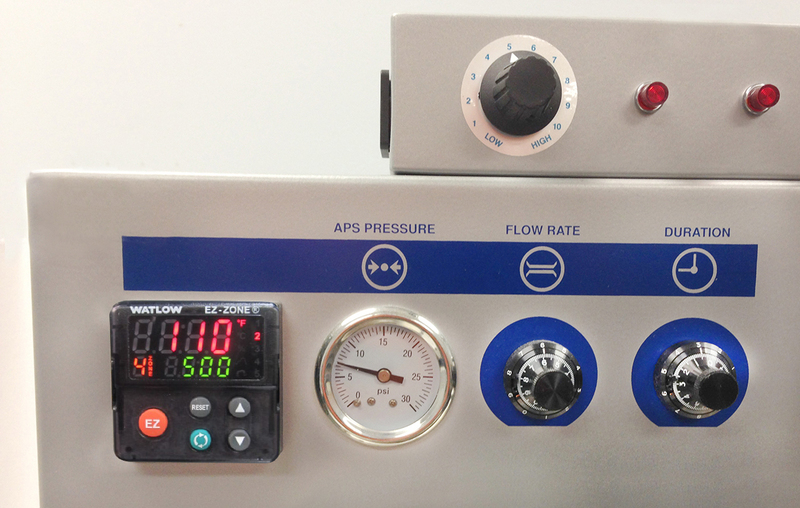 • Process parameters are set - dwell time, flow rate, temperature and heated area. • delicate or thermally challenging assemblies. 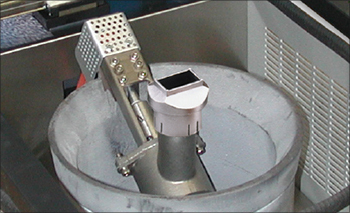 • High thermal mass (molten solder) equates to low operating temperatures. Controls allow you to set precision repeatability. • Minimizes copper dissolution in PCB barrels caused by excessive heat and dwell time. • Minimal thermal shock, localized PCB warpage and no component overheating. • Establishes the repeatable starting thermal condition. • Top and Bottom Preheater (6500 watts). • Preheater adjusts front to back (PCBRM System 5.2). • Preheater adjusts front to back and left to right (PCBRM System 5.2 DSP). • 1% of full scale. • Mounted on a rail slide to allow front and back positioning. • A front mounted safety guard is provided. • A thermocouple is attached to the board and the temp is digitally displayed. • to move the assembly from the preheater to the solder wave. Top/Bottom Preheater heats assembly to support the process. • Operator/board handling safety in insured. • stops), and Z location (adjustable) to the selective solder wave. • Once set, the operator simply places the board into carrier. • fillets. Compliant carrier arms account for PCB expansion. • when the preheat temperature is reached. • The process continues and the dwell time (5-15 seconds) is automatically controlled. Level solder wave to board contact is vital to successful reflow and operator safety. • Impeller pump design, high temperature bearings and belt insure long life. • Simple design for trouble-free operation. • Pump is mounted below the solder surface, minimizing dross accumulation. • Integral cast 2500 watt heating element. • Five (5) year warranty. Cast iron solder pot and titanium pump are designed to withstand corrosive, lead-free solder. 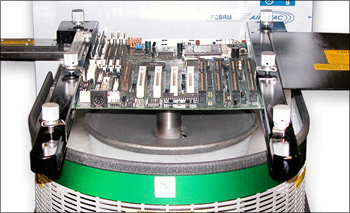 • Wave configuration is a critical factor in reflow desoldering and resoldering operations. • Flow Wells determine the solder wave, which matches the component lead pattern. • heat exposure to sensitive areas of the assembly. • Successful reflow soldering and rework is related to the flow well design. process and improve your productivity. • well, and developing a proven process prior to shipment. • Air-Vac maintains an assortment of standard flow wells and cleaning hoods. • We have 23 standard size Titanium Flow Wells. • We have 23 standard size Cleaning Hoods (in conjunction with the APS option). • The corresponding air cleaning hood positions the component over the flow well. • forcing molten solder to drop from the holes into the empty flow well. 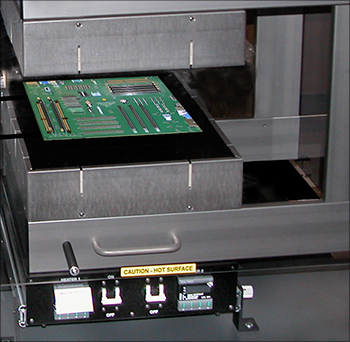 • Air-Vac specializes in custom specific tooling for complex boards. Solder flow is directed away from adjacent components. 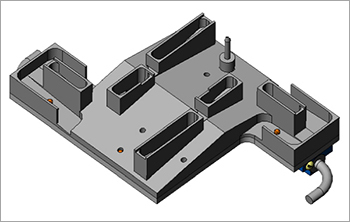 Custom Flow Well example, engineered for any component configuration. • required to meet changing customer and industry requirements. • engineering consulting is always available with every module or system. • If you wish, an Engineering Solid Model can be emailed to you for discussion on the process and procedure solution.